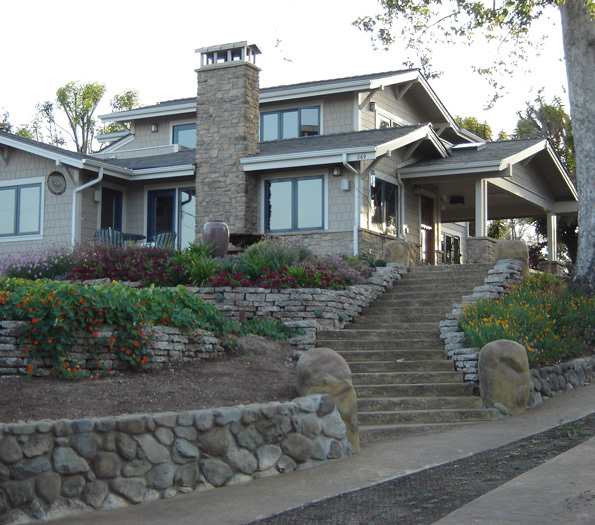 We designed a “cottage garden” to tastefully frame this Craftsman-style home. Beautiful Mediterranean perennials, native plants, and fruit trees are the superstars here along with our client’s own handmade pottery and sculptures that are featured throughout the gardens. Rainfall drains to a peaceful rain pond that recharges the water table, feeds on-site edible fruit trees, and reduces the storm water flowing into our creeks and ocean. Attractive soft gravel paths and smooth stone pebble bioswales meander naturalistically. Low walls now spaciously terrace the property, resulting in more useable garden and living space than existed before and to better capitalize on the 180 degree mountain views. A handsome lawn substitute, dymondia, needs little to no irrigation once established and no noisy and no air polluting mowing necessary! 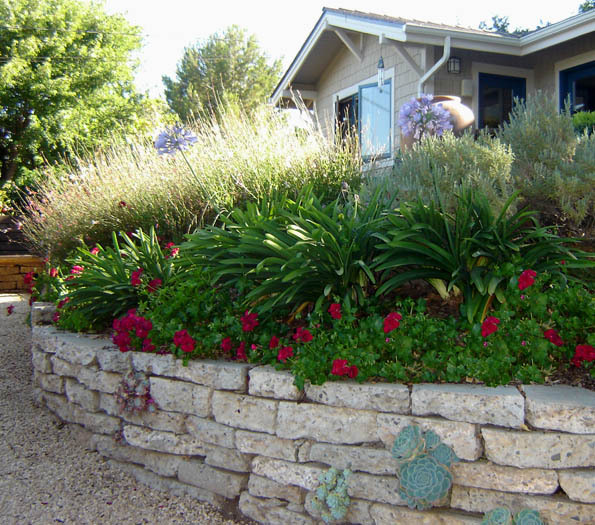 This model “green” home in Santa Barbara has won many awards and honors and has been featured on garden tours. The old concrete driveway has been given new life as low garden walls rather than going to the landfill. Use of succulents, natives and South Africans -- non-invasive and low water needs reduce dependence on supplemental irrigation. Succulents, natives and South Africans plants are naturally pest and disease resistant. Greywater from the washing machine irrigates and feeds outdoor plants with laundry soap that is also a fertilizer. Permeable gravel paths and rain pond retain stormwater allowing for percolation & groundwater recharge. Mitigates pollutants and does not contribute to storm flows. Inconspicuous solar panels on the roof provide more than enough energy to meet all their needs.